WASHINGTON/FRANKFURT/BEIJING (Reuters) - An increasingly shrill exchange of words between the United States and China that is threatening to trigger a global trade war has claimed another victim - Germany's auto sector. Luxury carmakers Daimler and BMW joined American farmers and Chinese solar panel and steel makers among the first casualties in what looks set to become a bitter trade war on a global scale of a kind not seen since the 1930s. While most economists believe a tariff war between the world's two largest economies will not derail global growth even if U.S. President Donald Trump follows through with duties on $450 billion of imports from China, individual industries such as agriculture, autos and technology look set to be hit hard. Daimler on Wednesday cut its 2018 profit forecast while BMW, whose Spartanburg, South Carolina plant is the largest single exporter of vehicles in the United States, said it was looking at "strategic options" because of the threatened trade war. The first test of whether a tariff war will indeed start comes on July 6, the date on which Trump has threatened to enact the first portion of duties on a planned $50 billion of imports from China. Beijing has pledged retaliation and Trump has threatened to push harder in response, saying that there could be tariffs on up to $450 billion of imports from China, close to the $500 billion of goods the United States gets from the world's second largest economy. A trade war between the United States, which is mired in battles with allies in Europe and North America over trade, immigration and foreign policy, and China, the world's emerging economic and military power, now looks as if it will involve the entire world if both sides follow through on their threats. "It is deeply regrettable that the U.S. has been capricious, escalated the tensions, and provoked a trade war," Chinese Commerce Ministry spokesman Gao Feng said on Thursday. "The U.S. is accustomed to holding 'big sticks' for negotiations, but this approach does not apply to China." At the same time as Gao and Chinese newspapers stressed that Beijing would strike back, President Xi Jinping told foreign company executives in Beijing that he was pressing ahead with promised tariff reductions promised in April. Items such as cars have seen pledges of cuts and in May, Beijing said it would lower import tariffs on 1,449 consumer goods, starting from July 1. Beijing has sought to portray itself as the guardian of global free trade, a crown that has been abandoned by the United States since Trump took office in 2017 with his protectionist agenda. "I've been honoring my words with actions," Xi told a group of foreign chief executives in Beijing on Thursday. Although there has been no record of talks between the two countries since a deal to negotiate a reduction in America's trade deficit with China fell apart, some political analysts in the United States believe Trump may pull away from the tariffs before July 6. The continued harsh rhetoric from Washington appeared to cast doubt on that, however. "What we have to do is create an environment where it's more painful for these parties that have these huge trade barriers, both tariff and non-tariff; got to make it more painful for them to keep those barriers than to get rid of them," U.S. Commerce Secretary Wilbur Ross told broadcaster CNBC on Thursday. Financial markets have been hit harder with the rise in threats, and car companies felt the brunt of that on Thursday, even though companies like General Motors and Ford Motor rebounded from earlier stock price lows. GM closed almost 2 percent lower on Thursday while Ford lost 1.3 percent and Tesla plunged 4.1 percent. A trade war would hit U.S. farmers, a vast majority of whom supported Trump in the 2016 election. Adding to the woes of soy farmers, who have seen the value of their commodity fall to multi-year lows, pork farmers were set to feel the heat from China as well. Last week pork was included in a second round of tariffs to be imposed on July 6. No other products have been listed twice and it now faces cumulative import duties of 71 percent, not including value added tax, according to a formula published on the website of China's finance ministry last week. Chinese shares fell 1.2 percent on Thursday on investor worries about the trade dispute, with the Shanghai index languishing at a two-year low. 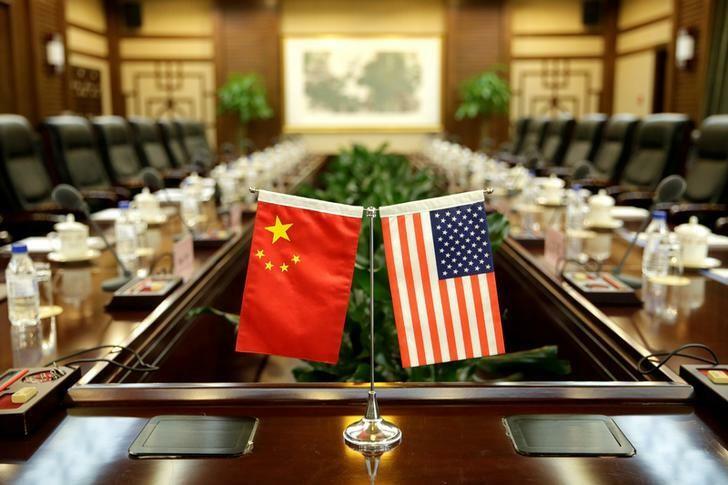 China has said it would impose additional tariffs on 659 U.S. goods, with duties on 545 to kick in on July 6, after Trump said Washington would levy tariffs on $50 billion of Chinese products. Beijing has yet to set a tariff activation date for the remaining 114 U.S. products, which include crude oil, coal and a host of refined fuel products. Some Chinese economists have said that while Beijing cannot agree to Trump's excessive demands, some of the issues raised by Washington could be implemented and would, over the longer term, benefit China. "We cannot be soft with Trump. He is using his 'irrationality' as a tactic and he is trying to confuse us," said Chen Fengying, an economics expert at state-backed China Institutes of Contemporary International Relations. "But if we could accomplish some of the things that he wants us to do - such as IP (intellectual property), market reforms, he'd be helping us. Of course there are risks, those would depend on how we handle those reforms."